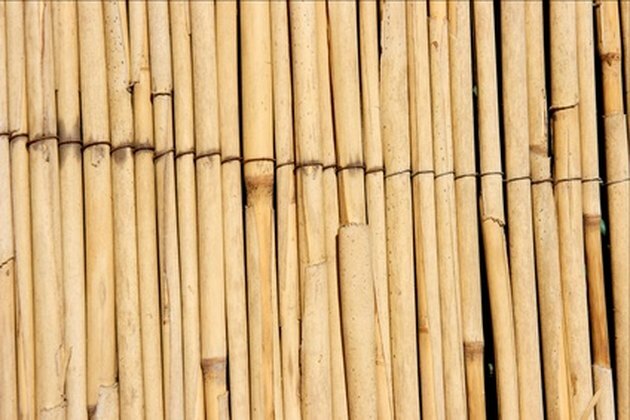 Reed fences provide an ornamental covering for chain-link fences, wood fences and foundation coverings. They add a tropical feel to an outdoor location and provide privacy. The density and construction of a reed fence causes it to weather quickly when placed outside in an area that is subject to the elements. Preventative measures to extend the life of a reed fence is accomplished through the application of a wood preservative with a UV protectant. Protect a reed fence using a water repellant with UV protectant. Open the hand sprayer. Fill the container with the water repellent with UV protectant. Close the top of the hand sprayer. Pump the handle 15 to 20 pumps. Point the nozzle toward the reed fence. Spray the area with an up-and-down motion. Spray the front and the back of the reed fence, if possible. Pump the handle as needed to keep the pressure constant within the sprayer. Let the sealant dry for the recommended time stated on the water repellent container instructions. Apply a second coat of sealant to the surface of the fence. Let dry. Repeat the process every two to three years. How Long Do Cedar Fences Last?